Danyal recently obtained his Juris Doctor from the University of Windsor. While at Windsor, he was involved in several extra-curricular pursuits. In his second year, he volunteered with Windsor Community Legal Aid, assisting clients in Small Claims and Landlord Tenant issues. In his third year, he volunteered with Pro Bono Canada, assisting the Children’s Aid Society with legal research. Danyal was also a member of Windsor Law’s Animal Rights Club and worked with Windsor Law’s Alumni Office to generate funds for the school. 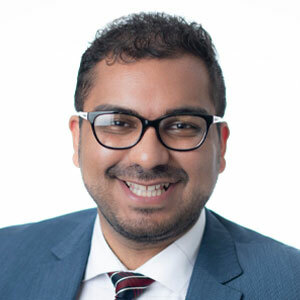 Prior to law school, Danyal completed his undergraduate studies at the University of Ottawa where he received an Honours Bachelor of Social Science degree in Political Science with a minor in Criminology. In his spare time, Danyal enjoys performing in his band, spending time with his family and playing fetch with his dog Chum Chum. Danyal has an avid interest in hip-hop, basketball and religious history.